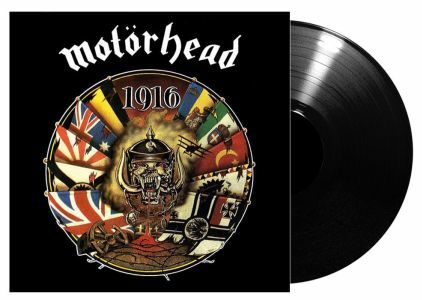 MOTORHEAD - 1916 VINYL (LP BLACK) | Online Shop | Wizard LTD. Album: "1916 VINYL (LP BLACK)"
1916 is an album by Motorhead. It was released on February 26, 1991 on WTG Records. This was their first album recorded for WTG after the legal battle with GWR Records was resolved. In the album&apos;s liner notes, the band says "...to the people we left behind - we didn&apos;t want to leave ya, but we really had to go! This album is the better for it. Stale and on a treadmill in our career, a change was needed." The title track is a reflection on World War I killings, it is an uncharacteristically slow ballad in which Lemmy&apos;s singing is only lightly accompanied. "Love Me Forever", a ballad which was later covered by Doro Pesch. "R.A.M.O.N.E.S. ", a tribute to punk band the Ramones, was later recorded by the Ramones, which can be found as one of the two studio tracks on Greatest Hits Live. The Ramones also performed it at their final show with Lemmy, with that show being released on video and CD as We&apos;re Outta Here. In the studio the band recorded four songs with the producer, Ed Stasium, before deciding he had to go. When Lemmy listened to one of the mixes of "Going to Brazil", he asked for him to turn up four tracks, and on doing so heard claves and tambourines that Stasium had added. Stasium was fired and Pete Solley was hired as producer. The album reached number 24 in UK charts and was nominated for the Grammy Award for Best Metal Performance at the 1992 Grammys, but lost to Metallica&apos;s Metallica.